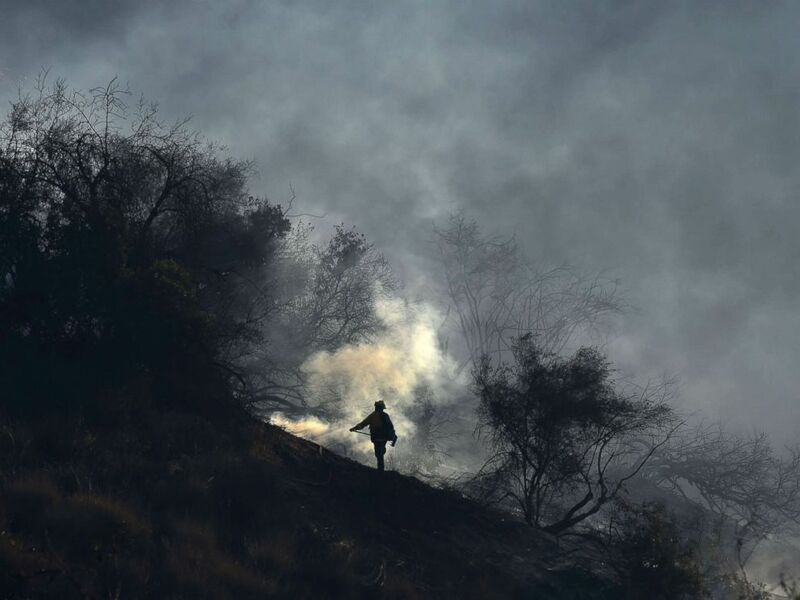 The Skirball brushfire that caused residents of Los Angeles' affluent Bel-Air neighborhood to flee their multimillion-dollar mansions last week was sparked by an illegal cooking fire, the Los Angeles Fire Department said in a press release Tuesday. 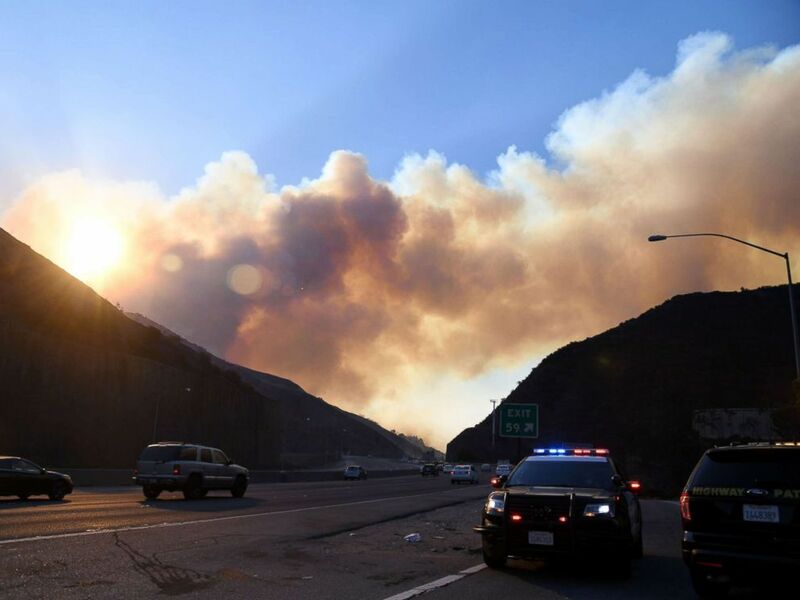 The fire broke out on Dec. 6 just before 5 a.m. at an encampment under Interstate 405 and Sepulveda Boulevard in Los Angeles County, the department said. The fire then spread through arid landscapes was fanned by Santa Ana winds, which have exacerbated five other fires in the state in the past week. No one was present when authorities arrived at the area of origin, and no arrests have been made in connection with the fire, officials said. The Skirball fire has burned more than 400 acres, destroyed six homes and damaged 12 others in Bel-Air, the fire department said. As of Tuesday, it was 85 percent contained, but dozens of firefighters continued to work to achieve 100 percent containment, according to fire officials. Last week the Skirball fire caused all Los Angeles Unified School District schools in the San Fernando Valley and 17 schools on Los Angeles' Westside to shutter because of poor air quality, officials said. All evacuations due to the Skirball fire have been lifted. 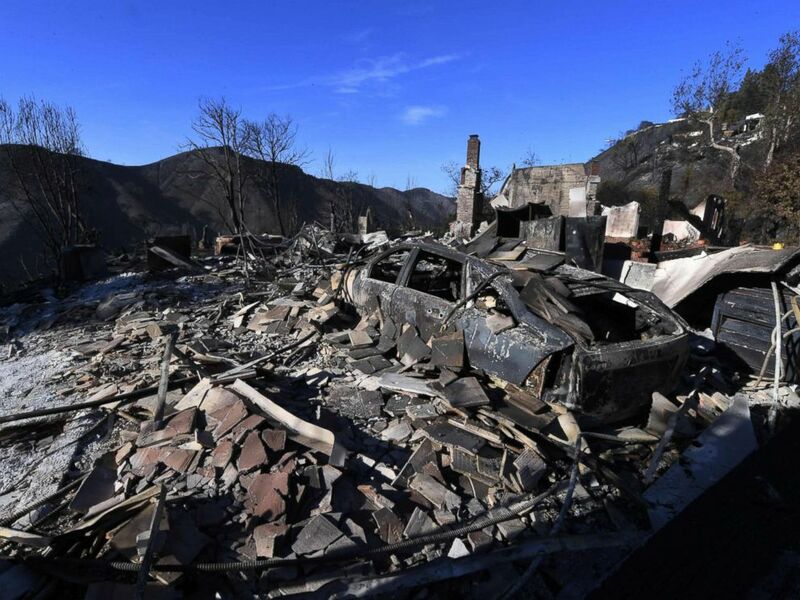 A burnt out house and car are seen after the Skirball wildfire swept through the exclusive enclave of Bel Air, Calif., Dec. 7, 2017. Smoke from the Skirball Fire rises above the 405 freeway near the Bel-Air area of Los Angeles, Dec. 6, 2017. A member of a fire team hand crew monitors embers to prevent fire from jumping to the west side of the 405 freeway, at the Skirball Fire near the Bel Air area of Los Angeles, Dec. 6, 2017. About 90 percent of wildfires in the U.S. are caused by people, according to the National Park Service. The fires are often caused by campfires that are left unattended, the burning of debris, cigarettes that are discarded negligently or intentional acts, the agency said, with the remaining wildfires caused by lightning or lava. 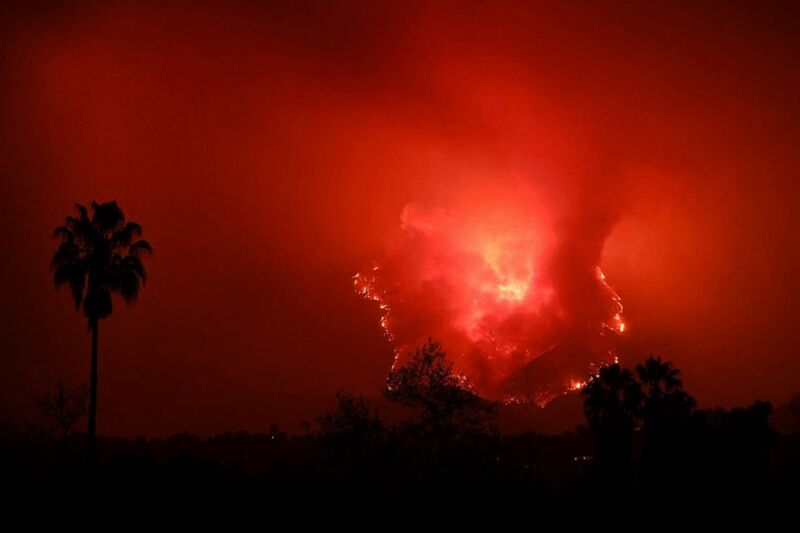 Five fires are still blazing through the Golden State. The Thomas fire, threatening more than 18,000 structures in Santa Barbara and Ventura counties, remains the main concern for firefighters, at just 25 percent containment. 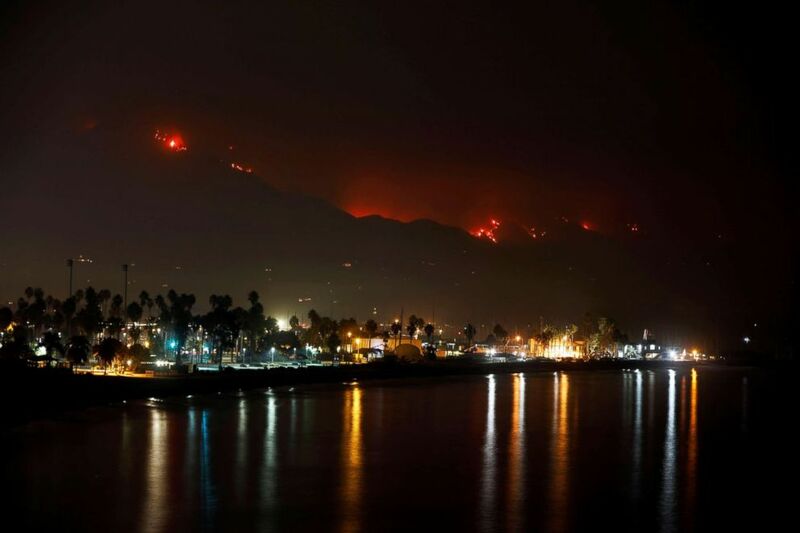 Santa Barbara harbor stands as wildfire burns along the coast during the Thomas Fire in Santa Barbara, Calif., Dec. 12, 2017. More than 6,000 fire personnel are still battling the Thomas fire, which has singed more than 236,000 acres, growing by more than 50,000 acres on Sunday alone. The Thomas fire has destroyed nearly 800 structures and damaged at least 187, according to the California Department of Forestry and Fire Protection. 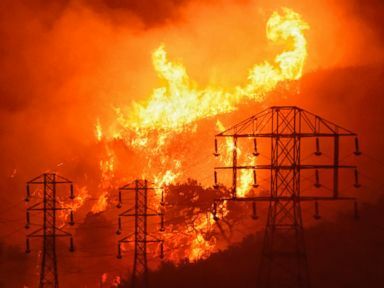 Flames from the Thomas Fire burn in the hills of Montecito, Calif., east of Santa Barbara, Dec. 11, 2017. Severe weather will continue to promote significant fire growth in Santa Barbara County, the Department of Fire said. Each of the remaining wildfires — the Lilac, Creek and Rye fires — were at least 92 percent contained as of Tuesday afternoon, officials said.